Getting folks to quit smoking is hard because nicotine is so addictive, but it also makes for fertile creative ground. This outdoor ashtray brings home the impact of smoking on your lungs with a powerful visual. 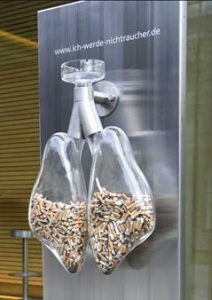 This particular installation/ashtray, produced by German insurance company AOK, drove over 6,000 visitors to a stop smoking web site just on the first day they were put up. 11 years later, this installation is still relevant – and impactful. What are some other examples of Gorilla marketing that stick out in your mind? Leave us a comment below. In the meantime, we’ve seen a lot of success driving awareness with our Lungs Promotional Stress Relievers. You can shop them here. where can one of these be purchased at?